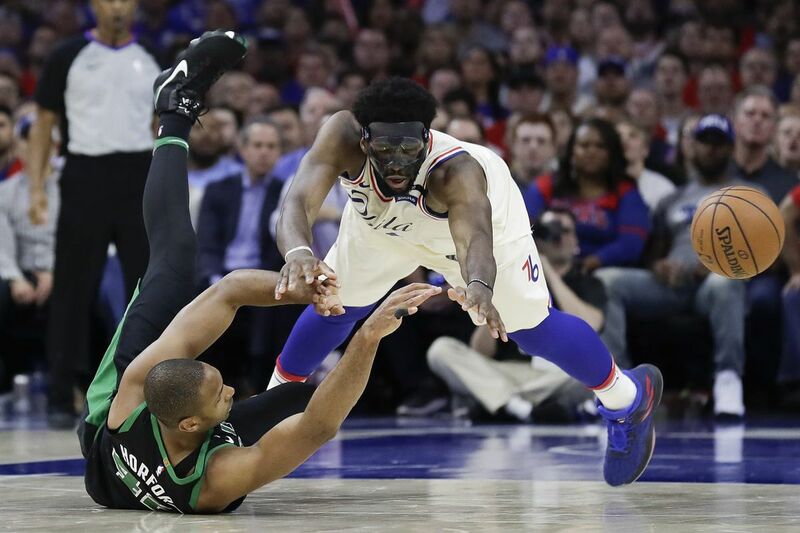 Joel Embiid and Al Horford chase after the ball in the fourth quarter on Monday. Joel Embiid and New Orleans Pelicans center Anthony Davis are the only players in the NBA playoffs averaging at least 20 points and 12 rebounds. The 76ers center is averaging 20.6 points and 12.9 rebounds through seven postseason games. He had 15 points and 13 rebounds in a 103-92 Game 4 victory over the Boston Celtics on Monday in an Eastern Conference semifinal. This marked the all-star's sixth straight postseason double-double. It's the most by a Sixer since Hall of Famer Dikembe Mutombo recorded 11 straight from May 20 to June 10, 2001. Coincidentally, Mutombo sat courtside at Monday night's game. Hall of Famers Charles Barkley and Moses Malone are the only other players in franchise history with at least six consecutive postseason double-doubles. Brett Brown is a fan of Celtics center Al Horford, and it's understandable why. "How good is he? Really?" the Sixers coach said. "If we didn't appreciate Al Horford like by now, you better. You see his defensive job that he had late on Joel. You see him change the dynamics with a five-man that can shoot. [Boston head coach] Brad [Stevens] does a great job of using him." The Sixers finished with 24 assists on Monday. It was their 43rd straight game with 20-plus assists dating back to the regular season. This is the league's longest streak since the Phoenix Suns recorded 45 straight during the 2006-07 season. It's the Sixers' longest streak since the 1983-84 season. Lloyd Pierce's second interview with the Atlanta Hawks for their vacant head coaching job is scheduled for Tuesday in Boston, according to ESPN. The 76ers assistant coach is a leading candidate to get the gig. The Sixers will be in Boston for Wednesday's Game 5 of the Eastern Conference semifinals. Pierce, who runs the Sixers' defense, has been on the coaching staff since the fall of 2013. The Sixers won a combined 47 games during his first three seasons, including the team's 10-72 campaign in 2015-16. Last season, the Sixers went 28-54 before improving to 52-30 this season.